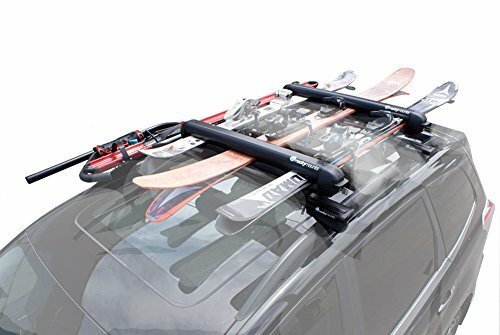 For hauling your sticks or boards up into the sky, the RockyMounts LiftOp Roof Rack is tough to beat. The hinged clamp design is padded by rubber "gums" that flex enough to allow for up to 2. 75" of vertical capacity, which is more than enough to accept even freakishly thick planks. The tubular profile is relatively quiet, saves fuel compared to any wall-like rack profile, and the wide clamp design provides a particularly secure grip. The rack attaches with form-fitting cable mounts that can clutch onto nearly any crossbars, including stock bars and those of competing brands. The size Small rack's clamping area is 16" wide (21. 5" overall) and can accept 3 pairs of skis or 2 boards. The size Medium's clamping area is 24" wide (29. 5" overall) and can accept 4 pairs of skis or 4 boards. The size Large has a clamping area that's 32" wide (38" overall) and can accept 6 pairs of skis or 4 boards. All listed equipment capacities are estimates, and your gear may vary. Each rack measure 5. 5" tall from the top of the crossbar on which it's mounted. If you have any questions about this product by Rocky Mountain, contact us by completing and submitting the form below. If you are looking for a specif part number, please include it with your message.